Let me start with a disclaimer first. No matter what you do, your alternative to dairy in any form (milk, cheese, butter and so on) is never going to taste as if it is made from an animal milk. So if someone tells you to add coconut/ cashew/ rice/ peanut/ almond/ oat milk to your tea or coffee, know that in doing so you will not get what your tongue has been used to 20 years. Instead you will get a brand new flavour that will require some unlearning and relearning but is so much more better than an animal product in so many ways. Dairy products play a big part in every Indian meal. I love how people say they eat "half a teaspoon of curd" for lunch or add "one drop of milk" to their coffee or tea. It's never true. Dairy is so prevalent in our food and our culture, it is very hard to avoid if you are not paying attention. 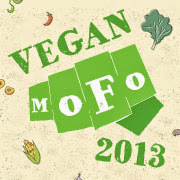 This post deals with something most people attempting veganism are struggling to give up or replace - yogurt / curd. The best part about dairy alternatives for curd is that you can make curd out of so many different raw materials and each has its own taste and flavour that can be adapted to savoury and sweet needs. Imagine having 10 different kinds of plain yogurt. I have tackled peanut and cashew curd in this post. Many people use dairy curd to start off their yogurt cycle, but I prefer not to contaminate mine. To set it into curd, I have used the stems of fresh green chillies. This practice is known to a few and is used to set dairy curd. But the idea to use it for non-dairy curd was thanks to Harini of Tongue Ticklers. She has done it before here. 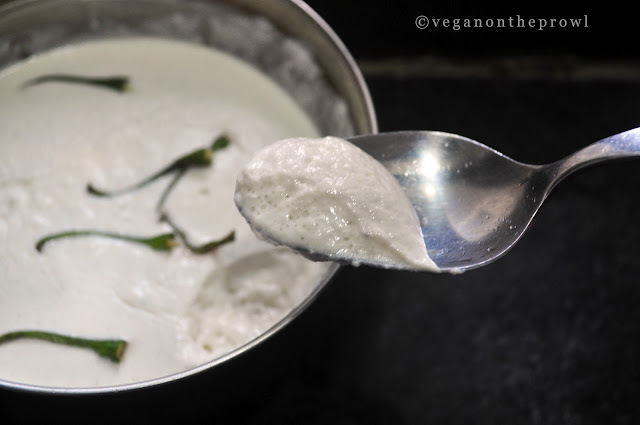 When I gave up dairy, I also gave up the south-indian idea of eating a big serving of curd after every meal. So I do not make curd on a daily basis. When you are starting off, always make them in small quantities because most often than not, they are not going to set as you want the first time. If you are using green chillies, wash the entire green chilli and carefully pluck out the stem. Do not wash the stem again. Store a small portion of this curd to set the subsequent curds as you would do with dairy milk. You can also freeze a portion to use it later. Grind the peanuts in a grinder with half a cup of water. Put it through the sieve and squeeze out the milk from the fiber into a heavy bottom vessel. Put the fibre back into the grinder with half more cup of water. Grind and sieve. Repeat once more. You now have peanut milk, a white frothy liquid that has a concentrated taste of peanuts. Warm this peanut milk while stirring continuously. It takes about 3 minutes to get to a lukewarm temperature. Take it off the stove. If it is too hot wait for it to cool a little bit. Add the stems of the green chillies and it is remain in a cool dark place for 10 to 12 hours. I usually keep it in the oven overnight. What you should get after it "sets" is a light yogurt floating on top and excess water below. Remove the chilli stems. If you want a thick curd, scoop out this floating mass. If you are going to make buttermilk use it with the water. Store it in the refrigerator. Peanut curd is very strong in taste. It is quite putting off if consumed plain. The best way to consume peanut curd is to make it into a raita by adding flavouring spices, salt, chillies and grated vegetables. Or make it into a buttermilk by adding salt, asafoetida and a chilli-curry leaf paste. I have also used peanut curd to replace dairy curd in cooked dishes like kadhis, kurmas and avials. Grind the cashew in a grinder with the water into a smooth fine paste. Put it in a heavy bottom pan and heat it for 3 minutes. Add the green chilli stems and let it sit still in a cool, dark place for 10 hours or so. This one sets much more thicker than the peanuts. There is no seperation. Once it is set, it bubbles as you touch it. Store it in the refrigerator. Cashew curd tastes a bit more sour but sweeter. 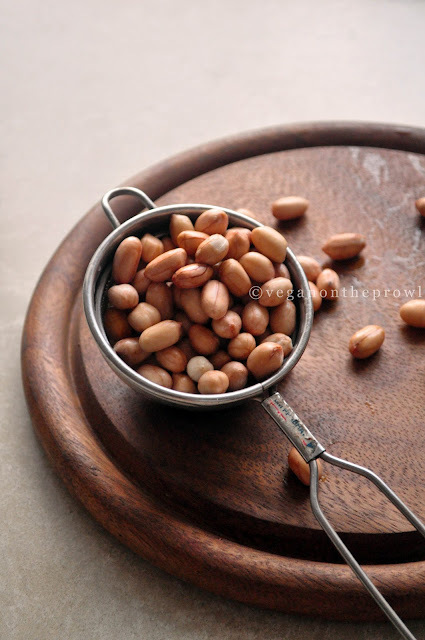 It doesn't have a dominating flavour like peanuts so it can be enjoyed plain. It can be used for raitas and also in sweet dishes. I have heard of cashew butter and was planning to buy a bottle to check what it was. The curd is new. 'Let me start with a disclaimer first. No matter what you do, your alternative to dairy in any form (milk, cheese, butter and so on) is never going to taste as if it is made from an animal milk. ' ... OMG!! Perfectly written! :D Few months ago, I bought tofu instead of paneer, made a usual paneer tikka masala just substituting paneer with tofu.. And I attacked it with excitement thinking this will be the end of my affair with paneer. Alas! I hated the taste! The tofu was so obviously in-you-face not paneer! It took me quite a while to get used to the taste, you know. I loved the idea of a cashew curd. Although how my tongue would like it is questionable! :) Hoping to try this sometime soon. DO you eat this with rice? Many people have that issue with tofu and it puts so many people off the idea of giving up dairy because they think that is how vegan food will taste! :) You managed to get over the beany-ness of the soya, which is awesome! Cashew curd is great with rice. I like it that way. Wow! The peanut curd is interesting.. gotta try that one..
this is so fascinating, thanks for sharing! I love to DIY as much as possible, and this method is a revelation! Thanks Kirsten! I love DIY methods too so you know what exactly is going into the food you're eating. I will do a post on that soon. Thanks for stopping by! Chilli Steam = is what we normally throw away ? Im sorry your attempt FAILED! I've never tried it with almond milk and I think that's one reason it didn't work. Almond milk is way too thin assuming you used store bought milk. Wow unlike old Jess up there mine turned out great on the first try (cashew)! Thank you for the great post-I gathered all I could about it before I started but really needed the pictures to understand. Many thanks! Good to know! :) thanks!